1. 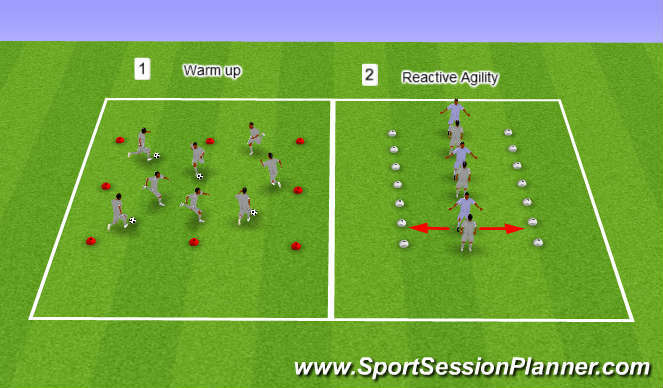 Dynamic warm up, moving around with the balls, couple of touches, move the ball on. Stop to linear lunge, lateral lunge, squat, single leg squat, linear leg swings, lateral leg swings. In pairs. One leads, one reacts. Can move left, right, jump up or touch the ground. - Opposites - one leads, partner performs the opposite (left-right, right-left etc.) Cognitive aspect. Warm up, coaching points of lunge/squat matrix. Reactive agility - verbal/visual cues, cognitive aspect too. - to move effectively and react, low centre of gravity, wide base, balls of feet.